As 2012 comes to a close, NJOP, (http://www.njop.org) and its social media platforms, Jewish Treats and @JewishTweets recall the social media moments that had us in shock, tears, stitches and pride throughout the year. For photos and links, visit http://www.jewishtreats.org and join the conversation with @JewishTweets on Twitter. Edon Pinchot, an Orthodox 14-year-old from Chicago, was nicknamed the ‘Jewish Justin Bieber’ while appearing on the NBC reality show, America’s Got Talent. Edon proudly wore a kippah during each of his performances. The JCC of Rockland County penned a petition asking for a Minute of Silence at the 2012 London Olympics Opening Ceremonies in memory of the Munich 11. The petition, which garnered more than 100,000 signatures, may have fallen on deaf ears at the IOC, but viewers worldwide took note as @JewishTweets orchestrated a Social Media Minute of Silence on July 27th across Facebook and Twitter. popular Jewish tune, Hava Nagila, for her gold medal-winning floor exercise routine, instantly becoming America's Jewish Sweetheart. 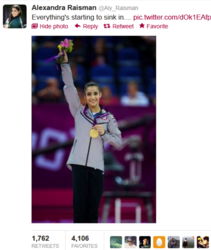 Raisman left London with three Olympic medals: two gold and one bronze. A video of an Israeli baby “driving” into his own brit milah (circumcision) in a remote controlled car ignited great debate about circumcision celebrations. Another circumcision-inspired controversy made social media headlines this past summer when a German court effectively banned the religious practice. Recently, however, Germany's parliament approved a bill to keep circumcision legal. In November, during Operation Pillar of Defense, Israel and Hamas waged a Twitter war. The Israel Defense Force used social media to announce and comment on military operations. Jewish humanitarian groups used social media to reach volunteers in the aftermath of Hurricane Sandy. Powerful pictures (including one from the Friends of Refugees of Eastern Europe synagogue in Brighton Beach, Brooklyn, of a Torah unraveled to air dry) were circulated on Facebook and Twitter. The online community rallied in support with donations of funds, supplies and even a Torah for one Long Island congregation. Readers enjoyed Mayim Bialik’s blog on the Jewish parenting website Kveller and visited regularly in 2012 for her firsthand accounts about everything from her hit CBS comedy, The Big Bang Theory and her Emmy nomination, to her children, a car accident, a divorce announcement and her glamorous red carpet experiences. Presidential candidates Barack Obama and Mitt Romney each used social media to try to sway Jewish voters in 2012. Both party conventions featured prominent rabbis, Rabbi David Wolpe from Los Angeles and Rabbi Meir Soloveichik from New York. Yeshiva University Maccabeats grads created a breakaway a capella group called StandFour and garnered a quarter million views of their debut video during Chanukah. The nation joined together in mourning for the 20 children and 6 adults who were killed at Sandy Hook Elementary in Newtown, CT. Outpourings of support for the Newtown community were posted across all social networks. The youngest victim was 6-year-old Jewish kindergartner Noah Pozner. The Pozner family's rabbi, Rabbi Shaul Praver, recited El Maleh Rachamim, the Hebrew memorial prayer, at a vigil attended by President Obama and family members of the victims. NJOP was established in 1987 by Rabbi Ephraim Z. Buchwald in response to the spiraling losses of Jews from Jewish life due to assimilation and lack of Jewish knowledge. Through meaningful educational programming and influential social media platforms, NJOP conveys the vibrancy of Judaism to modern Jews. Over the last quarter century, NJOP has engaged nearly 1,400,000 Jews in positive, joyous, Jewish experiences. NJOP’s renowned programs have been offered at nearly 5,000 synagogues and Jewish organizations across the nation and in 39 countries around the globe. NJOP is consistently ranked as the leader in social media, generating hundreds of thousands of daily impressions via the @JewishTweets Twitterfeed and Jewish Treats blog and Facebook Page. The Jewish Treats YouTube channel boasts more than 1 million views.